The Round Timber Fire Table by Homecrest offers elegance and timeless style for years of outdoor entertainment. The round table top is cast from reclaimed woods for a stunning natural wood grain quality and the frame is constructed from a light weight durable aluminum. 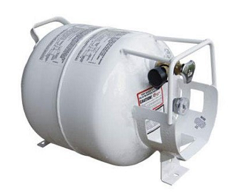 This outdoor fire table is propane tank ready but also comes with a natural gas conversion kit for those who would like to connect them to a hard line. To match your patio design needs this fire table includes 10 lbs of fire glass and your choice of table top and base color so you can create a table to fit with your decor. Proudly manufactured in the USA; you can be assured that your Homecrest band name fire tables will not only add value to your outdoor living area but are built to last.